The activist joined politicians and fellow musicians, including former Smiths guitarist Johnny Marr, calling for inmates to be granted use of guitars with steel strings as well as nylon - the latter being used primarily for classical and Spanish styles. Bragg, who started the Jail Guitar Doors initiative in 2007 as means of helping prisoner rehabilitation through sourcing guitars for prisons, said: "As an incentive to engage in rehabilitation, individual access to steel-strung guitars can really help the atmosphere on a prison wing. 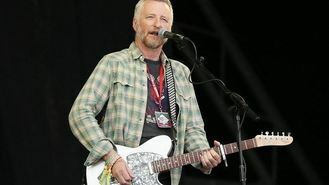 "I've had a number of projects involving guitars on hold which now will be able to go ahead, and will allow those using music in prisons to get on with this important work." Labour MP Kevin Brennan (Cardiff West), who also supported the campaign, said: " This is a victory for common sense and I'm pleased after months of campaigning the UK Government has listened. The power of music to help prisoners to rehabilitate is well documented. "I started the campaign after prisoners wrote to me explaining how they had saved from their small prison wages to buy guitars and how therapeutic learning to play the guitar had been for them before the ban. "If we want to reduce reoffending we need to support purposeful activities like learning to play an instrument."